Jefferson Texas is well known for its Mardi Gras Celebration, it is one of the biggest in Texas. This year the dates are set for Feb. 5-7, 2016. So come on out catch some beads, listen to bands all over town, watch the parades every day and have fun with friends and family. Friday, February 5: Main Stage “The Night Hawk Band ” @ 6:00 p.m. – 10:00 p.m.
Krewe of Hebe’s Doo Dah Parade @ 7:00 p.m. This parade is a fun, wild and wacky sea of golfcarts, walkers and pets all dressed up in their fun and creative costumes. You must not miss this! Saturday, February 6: Typically the parade routes are pretty packed early, so make sure you have plenty of time to pick your spot well before the parade begins. Main Stage “Michael Hix” @ 12:30 a.m. – 2:00 p.m.
Krewe of Hebe Motorcycle Parade @ 1:45 p.m.
Krewe of Hebe Grand Parade @ 2:00 p.m.
Main Stage “Michael Hix” @ 3:00 p.m. – 4:30 p.m.
Main Stage “Awards Ceremony” @ 4:30 p.m. – 5:00 p.m.
Main Stage “Davin James ” @ 5:30 p.m. – 8:00 p.m.
Main Stage “ Cody Canada ” @ 8:30 p.m. – Until . . .
Sunday, February 7: Main Stage “Live Entertainment ” @ 12:00 p.m. – 4:00 p.m.
Krewe of Hebe Children’s Parade @ 2:00 p.m.
Children’s Activities – Otstott Park/Gazebo @ 3:00 p.m. 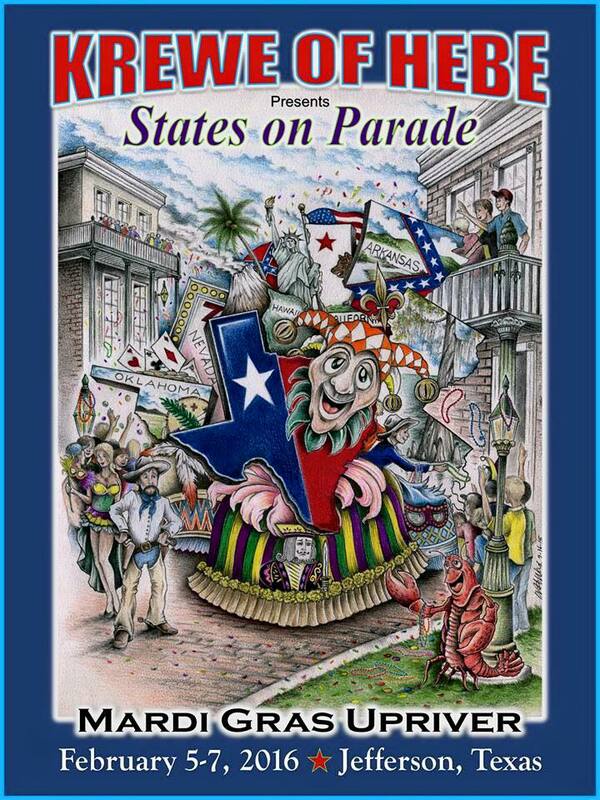 This entry was posted in Mardi Gras Upriver by Tammy D. Bookmark the permalink.